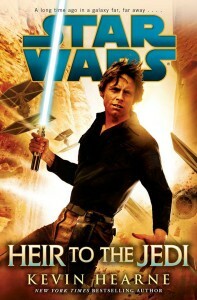 Of the new books, I was most excited about Heir to the Jedi. This time frame is my favorite part of the EU. Star Wars, to me, has always revolved around Luke’s story and Heir to the Jedi is the new beginning of Luke’s Expanded Universe journey. I was also apprehensive about this book because I, Jedi is one of my favorite books and it is the only other Star Wars first person POV book. My standards for this book were probably impossibly high but despite those high expectations the book was a pleasant surprise. Heir to the Jedi continues the trend of the new EU having a higher quality. The first person POV from Luke was fascinating during this time frame. Kevin Hearne did a great job of getting into a young Luke’s mind. I really enjoyed reading the insecurities and feel that Hearne brought a previously missing depth to Skywalker. Other authors have attempted to give us this, but without actually reading Luke’s thoughts it was difficult to really capture how Luke felt after Obi-Wan Kenobi’s death and discovering the ways of the Force. So much of this part is seen in Empire and Jedi but the movies can only do so much without random narratives that wouldn’t have worked in with the rest of the films. It was fun to read Luke’s thoughts concerning his inadequacy with women and other things alongside his thoughts on the Force. Sometimes I think that Luke had to grow up too fast and this book served as a great reminder on how naive he really was when he blew up the first Death Star. 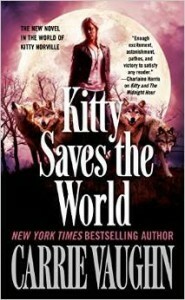 » Read more..
Carrie Vaughn is making a choice to end the story arc for her main character, a werewolf named Kitty. The supernatural world she created, though, is so much bigger than just the one character. So perhaps we will see books featuring other characters. She has already experimented with this and stated there is a big possibility for such books. She is doing what other authors who get bogged down with a certain set of characters should do. She is doing what Star Wars needs to do with this reboot. Another example of an author who knew when to walk away is Charlaine Harris whose books were the inspiration for True Blood. While I sometimes regret not being able to go to the bookstore and pick up the new Sookie Stackhouse book, part of me appreciates knowing there was an end for those characters. One could also look to J.K. Rowling who stopped at seven books for Harry Potter when she easily could’ve started next generation books with new bad wizards for the characters to fight (to be fair she still might do this.) I like having an end to a series. I didn’t realize how much I liked it until Vaughn’s recent announcement. » Read more.. Ask any child who has seen Star Wars who their favorite character is and I’d give even odds that they say Darth Vader. I’ve never understood it but this was definitely the case with my niece and nephew. I have also trooped with someone dressed as Darth Vader and it is incredible to see how much the faces of these children light up when the see him standing there. No one else exists when Vader is around. Now ask those same children who their favorite Disney animated character is and I’d bet they pick a good guy. Why is that? What is it about the villain that is Darth Vader that has captivated audiences for over thirty years? What is it about Star Wars in general that has people clamoring over the villains? They don’t have better toys as both sides have lightsabers and awesome spaceships, not to mention the use of the force. Realistically, I’m not here to answer that question and this opinion piece isn’t here to specifically address it or even focus on Darth Vader. This concept is something that has being bouncing around my head ever since my niece responded “Darth Vader” when I asked who her favorite character was in Star Wars over a year ago. I hadn’t quite figured out how to properly write up a piece concerning this topic until now. That is, until I read Tarkin. I didn’t quite realize what I was missing from the Expanded Universe until about halfway through Tarkin when a throw-a-way line caught my attention more than the entire book had so far. It was a lightbulb moment for sure. The EU had been missing depth in its villains. Even little lines about “flamboyant hats” and “frequenting the opera” give us a tiny insight into a character that otherwise we’d know nothing about. There is the depth to the Star Wars books that has been missing since the NJO. » Read more.. The excitement is back. I admit, the down time of not having any new Star Wars books almost made me walk away. As each day passed without having a new book and not knowing what the future was going to hold my brain distanced itself from the Star Wars Universe. Those nagging thoughts that I shouldn’t invest anymore of my money into something that might not matter on the whims of people who don’t get what being a book fan has meant to some people over the last twenty-some years. These last few months have been especially hard. I don’t remember a time when I went on a summer trip and didn’t have a new Star Wars book to accompany me on a plane flight. Anyone paying a lot of attention to this site has also noticed my lack of articles lately. That’s because I almost walked away. Completely. Sure I would’ve gone to see the Star Wars movies when they came out but I was seriously thinking about not reading anymore. At the start of all this, when we found out about the reboot I was excited. I get that these things don’t happen overnight but there is some millennial generation in me that wants things instantly and the wait for a new book began to weigh on me. Would I care about the characters anymore? I admit that part of me stayed with the EU because I just couldn’t handle not knowing what was happening to “my people”. Was Corran Horn being treated all right by the authors? Did Wedge Antilles ever get married? 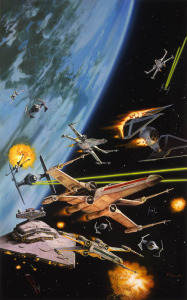 Would Gavin Darklighter ever lead Rogue Squadron? I had to know. How could the new universe ever replace the 17 year relationship I had with some of the EU characters. Those characters helped me through high school, college and some dark times in my life. How can I betray them by starting a relationship with new characters while not knowing if they’re going to be grandfathered in to the new universe? » Read more..
Disney Channel’s Phineas and Ferb Star Wars was a delightful take on A New Hope that kids and adults can enjoy. With little in jokes like the quote above even a pretty serious Star Wars guru will be able to find enjoyment in this cartoon. In classic Disney fashion they include some fun songs like “We Love Tatooine” and “In the Empire” that also include some pretty clever references and some hilarious rhymes if you listen closely. I will admit that I have watched quite a bit of Phineas and Ferb before I saw there was going to be a Star Wars episode so it is possible that I found more enjoyment in their take on Star Wars because I know the characters involved on both sides. I can’t guarantee that if you’ve never seen an episode of Phineas and Ferb that you’ll enjoy this as much as I did but really this is worth watching for the songs alone. The basic premise follows A New Hope by intertwining the Disney channel characters into the story. Three of the young characters are in the Empire, one is a smuggler, Agent Perry is part of the Rebellion, Phineas and Ferb play their usual selves only they are force sensitive friends of Luke Skywalker. This spread of characters allows the show to cover all aspects of A New Hope. Phineas and Ferb run into R2-D2 and the death star plans fall out of him. The two heroes then decide to embark on an adventure to get the plans back to R2-D2 and the Rebellion. » Read more..